The dreaming. Elisa told me I’d start remembering dreams during Mercury in retrograde. And, I have. A recurring theme has shown up, one that’s occurred several times over the last few months. It puzzles me, so I’m going to write about it here, see what writing has to tell me. The theme, present in several variations, is this. I go somewhere, often to a hotel in a large city, maybe for a conference, maybe for a temporary move. Last night I was somewhere, perhaps a college, but with friends, a new addition to the theme. Last night’s addition of friends did lower my anxiety level. I had offers to help pack. A group of African-American street guys offered to move some boxes in the trunks of their cars. Friends at the college, or whatever it was, packed a whole room full of books. Another group had a pick-up truck. Some were going to help me find boxes. It occurred to me for the first time in any of these dreams that I could go to a day labor place and hire folks to help me. Obvious associations. The move to Colorado. 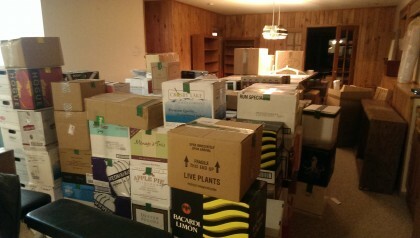 It took weeks to pack all my books, even with eliminating about a third of my library. 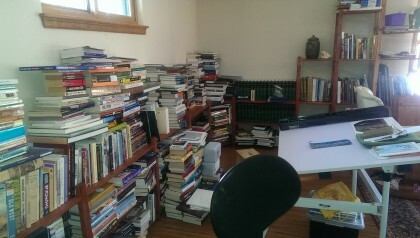 Each time I’ve moved since college, since 1969, I’ve moved more and more books onto the next place. It can feel overwhelming. And, book boxes are heavy. Each day now I come into the loft and the books are here, on shelves, on stands next to chairs, on desktops, open next to me on the table or the small laptop desk I use for holding things I’m using for writing. I don’t want to move. Ever again. There’s a threshold effect, one I apparently exceeded in the move out here. I don’t want to do it again. It just feels like too much. And that feeling synchs up pretty well with the feeling I get as these dreams fade. Too much. I can never get done. What can I do? Another association. The learning of a lifetime. All that knowledge stored in the neurons blinking on and off in my brain. Stuffed full. Like a crowded attic. Can I get any real use from it, crammed in and over abundant as it is? Or, is that the exact question? What if I can’t get any use from all the boxes of knowledge I’ve stored? Even as I write this I feel a slight tension in my abdomen. My feet went up on the chairs legs. Anxiety. A realization as I wrote. This might be about death, about legacy, about “success.” Have I added so many boxes to my life that I can never use them all before I go home, the home Ram Dass says we’re all walking toward together? Could this be reminding me that check-out time is coming and I’m not done yet. That I need to figure out a way to get done? What would that mean? I’m open to thoughts on this.